Russell has a deep, dark scar running horizontally across his right bicep. Furthermore, even a glancing medical scan will show that Chief Gregory's lungs are artifical. HOBBIES/INTERESTS Russell enjoys creating and collecting models of ancient Earth aircraft and the primitive spacecraft of nearly any culture (but specifically the 'solar sailors' of the ancient Bajorans and Xent'anians). He also enjoys holodeck simulations involving both ancient air- and spacecraft, and is quite a proficient dogfighter. A fledgling mecharcheologist, Russell also has a similar interest in most all the primitive electronic and mechanical devices and/or artifacts that helped advance the various races of the Federation to the point where they are now. It might be easier to say that history in general appeals to Russell. He also enjoys sports, including 'American' style football, baseball, and fishing. The Chief also enjoys a good hand of poker, and a good slice of thick-crust, Chicago-style pizza. Lastly, Russell has great interest in his daughter's life (most notably, in the social arena there-of). Born on Earth, to a single mother, Russell Francis Gregory led something just short of a charmed, early life. By the grace of Sol III's utopian society, Russell was never made to want, and was encourage to always pursue those hobbies which interested him most. It was that leverage in choosing his own preferences that originally led him to build his first subspace radios, beginning with a kit and eventually developing them from space parts. His knack for the engineering and tinkering sciences grew exponentially, and soon Russell was building and repairing hover-vehicles for his friends and enrolling in junior inventor fairs. His lust for adventure and exploration, however, is what eventually led to Russell seeking a career with Starfleet. His natural flair for leadership made him a near shoe-in for the Command Division officer's training, and after taking the entrance exam at the age of nineteen, he spent his first year as a Cadet. His first year in the officer program, however, served to his the only year. No more then three months after his enrolling at the Academy, he met the woman who would eventually change his life: Juilia Kingston, a waitress at a Creole eatery in the heart of New Orleans. Though she served to be initially resistant, the pair eventually started dating and soon fell deeply in love. 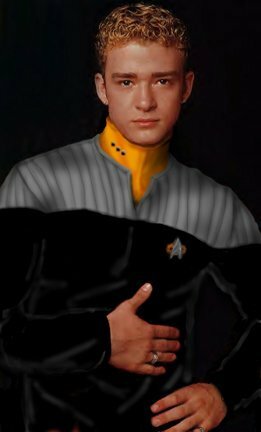 The couple's relationship became so serious in such a short period of time that Russell abandoned his demanding officer training, and reapplied to Starfleet Academy under the less restrictive requirements of the enlisted training program, engineering/operations division. Russell and Juilia were married shortly after Russell's graduation, two years later. Their love, bitterly, was not to last. Only one year after the birth of their daughter, and only after twelve short years of marriage, Juilia was killed in the explosive destruction of the USS MARKETPLACE. Russell left the service for nearly a year dealing with her death before coming to terms and re-enlisting per the urging of his mother. Despite that, he has made it a ritual to commemorate the anniversary date of his ex-wife's death. A sad duty which he shares now with his daughter, Janna, now that she is old enough to do so. A seasoned warrior and soldier, Gregory has served with honor and distinction during his Starfleet career. His biofile is almost littered with glowing commendations from previous commanding officers, as well as several official Starfleet commendations including the Starfleet Citation for Conspicuous Gallantry, the Award of Marksmanship, and the Accreditation of Piloting Excellence. His previous billets have afforded him a broad range of skills, spanning from security, engineering, operations, sciences and command, and he has become renown for using his vast skills to the best of his ability, regardless of task. Though, an accomplished pilot and shuttlecraft engineer, Russell's previous postings and broad skill base have made him a regular choice for away missions, diplomatic assemblies, science and engineering duties, and several other more mundane assignments, by his previous commanding officers. Russell Gregory is born on Sol III. Russell has still not full gotten over the loss of his wife, and therefore yet wears his wedding ring--though on the right hand.